If you have listened to the show for sometime, we would love to have you leave feedback on itunes. We know not all of you use itunes, but for those that do, it helps us become more visible. If you don’t use itunes, your feedback is still valuable. 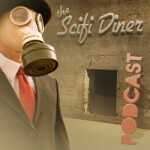 Visit our webpage at https://scifidinerpodcast.com and leave a comment on the show notes or email us at scifidinerpodcast@gmail.com We want to know! On tonight’s science fiction podcast, we talk about the web-series Reise, Dollhouse to end with a bang, Chuck’s season 3 just got longer, The Terminator: Sarah Connor Chronicles meets ABC’s V, SyfyWire’s Ten Most Awesome SciFi Characters, the midseason finale sinks for SGU, Star Trek XI is Named a top film of the year, what’s up with the “Real” Enterprise, why you’ll get your money’s worth out of Avatar, A Black Hole Remake in the works, we have the scoop on Spiderman’s new villains, and DVDs released this month that you’ll want to add to your Christmas List: Mystery Science Theater, Lost season 5, and Star Trek TOS Season 3 on Blu-ray. No Interview this week. First time in forever. Exciting people coming onto our show…. Dayton and Kevin will be back, along with Possibly the Vixen, Richmond Peck from V, Brian Jacobs Smith from SGU, David Alan Mack, author of the Star Trek Novel Vanguard, and Miracle from Dollhouse. Any questions for these guys let me know! Question: What do Stargate, Sanctuary and New Moon all have in common? Question: What does Firefly, Terminator, 4400, and Dollhouse all have in common? If you know the answer, call us at 1.888.508.4343, e-mail us at scifidinerpodcast@gmail.com, or contact @scifidiner on Twitter with your answers! All answers due by Dec. 15th. Some familiar sci-fi TV faces will show up on the new Web series Riese, including Smallville‘s Allison Mack, Battlestar Galactica‘s Allessandro Juliani and Sanctuary‘s Emilie Ullerup. Ullerup (the late Ashley from Sanctuary), plays “Aliza,” a revolutionary and companion. Mack (who plays Chloe on the CW show) will play a character named Marlise, an ambitious member of the Sect. Juliani (Gaeta from Battlestar Galactica) plays “Garin,” an officer of the resistance and a comrade of Rand. “Riese, a seemingly random wanderer, is being hunted by a terrifying religious cult, The Sect. Traveling from nation to nation for years, she is accompanied only by a wolf, Fenrir. Together they must evade the assassins sent by the Sect–who’ll stop at nothing to complete the task they failed to achieve many years ago. Other cast members include Christine Chatelain (Sanctuary, Supernatural), Ben Cotton (Harper’s Island, Stargate Atlantis), Sharon Taylor (Stargate Atlantis) and Patrick Gilmore (Stargate Universe). It’s available on the official site and on YouTube. Check out the trailer below. Seems like weeks since we last visited Fox’s Dollhouse. But it’s back tonight and for the next few weeks, with the final episodes of the now-canceled series. And if we know creator Joss Whedon—and we do!—there’s one thing that’s certain: He’s going to tell his story his way and take Dollhouse out in style. We’ve got seven unaired episodes yet to see, and Fox is going to air them regardless of how few 0f us decide to watch, starting with tonight’s two-hour block and continuing with double-headers for the next three Fridays in a row, beginning at 8 p.m. ET/PT. The show then takes a short break before coming back in January for the finale. So what do we have to look forward to? Lots of sci-fi guest stars, as well as Echo (Eliza Dushku) on a mission of her own involving Rossum, the corporation behind the Dollhouses. On Dec. 11, Echo returns to L.A. and begins to struggle with her multiple memory downloads in “Meet Jane Doe,” while Topher discovers there are dangers for our future when it comes to imprinting people. Alan Tudyk returns to guest-star as psycho-maniac doll Alpha, who is up to his old tricks in “A Love Supreme.” Meanwhile, Ballard (Tahmoh Penikett) tries to find allies in his mission to bring down the Dollhouse. The first of the Dec. 18 episodes, “The Attic,” will reveal more about the mysterious attic, where actives go when they are bad. Dollhouse will return with the final three episodes, starting Jan. 8, 2009. The series finale, which airs on Jan. 22, will be called “Epitaph Two: Return” and will act as a sequel to the never-aired-in-the-U.S. episode “Epitaph One,” which explored a dystopian future that resulted when the Dollhouse technology got out into the world. NBC originally ordered 13 episodes for the third season of its sci-fi spy comedy Chuck, then added six more when it moved the season premiere to January from March 2010, and now star Zachary Levi reveals that the new eps will tell a completely new storyline. “What worked out in our favor was that we didn’t think we were going to do a back six,” Levi said in a group interview on Saturday in Beverly Hills, Calif., where he was promoting Alvin and the Chipmunks: The Squeakuel. The six-episode mini-arc is a relief to Levi. He was worried that if they had to spread the 13-episode story over 19 episodes, the extra six eps would feel like filler. Chuck returns Jan. 10 on NBC with a two-hour season premiere, starting at 9 p.m. ET/PT. Some observers may be preparing the eulogies for the freshman ABC series “V,” but not the network itself. Sources have told Airlock Alpha that two new producers have started on “V” this month, and they should be familiar to genre fans. John Wirth and Natalie Chaidez are the newest additions to the “V” staff, making the move from “Terminator: The Sarah Connor Chronicles” where Wirth was an executive producer and Chaidez was a co-executive producer. Their exact roles are unclear, but they are expected to be a huge boost to the show’s writing team, and signal what could be continued confidence in the long-term vitality of “V” by ABC. The move comes in the midst of shakeups behind the scenes, including the recent decision to replace showrunner Scott Peters with “Chuck” executive producer Scott Rosenbaum on the eve of “V’s” November premiere. Peters, best known for his work with USA Network’s “The 4400,” had reportedly only helmed one episode of the series which aired four hours in November and won’t return until late spring. “V” got a solid start with viewers when it premiered Nov. 3 with an overnight 8.5 rating/13 share, according to Fast National ratings from The Nielsen Co. That was more than enough to place it on top of all genre shows for the first week of sweeps, and even finish in 10th place among non-news, non-event programming. However, by its second week, “V” fell by more than 22 percent, and would eventually finish its initial run with a 6.7/10 average, 21 percent off its premiere. The addition of Chaidez and Wirth has not been confirmed yet by ABC or Warner Bros. Television, so until that happens, this should be treated as any rumor would. Here’s our list of the 10 coolest, scariest, funniest and/or most fascinating characters we’ve seen this fall. Played by John Noble. From his goofy personality to his love of food at the most grim moments to his Walterisms, Walter is our favorite character of the decade. There’s no one like him on TV, and we can’t imagine anyone but Noble playing him. As fractured as Fringe stories can get, the writers and Noble never seem to lose track of who Walter is, even if he doesn’t have the answer to that one himself. While we know there are some dark moments ahead for our Walter, what with Peter (Joshua Jackson) certain to discover that Walter stole him from an alternate universe, we’re hoping that we get to see more of the charming Walter as well. We loved his sweet little romance with Rebecca (Theresa Russell). And Walter is such a normal dad-type guy when he looks at Peter with such love. As for the way he looks at Peter when he’s thinking of experimenting on him, well, that’s just creepy. Played by Morris Chestnut. Alien reptile underneath or not, he is one hot-looking human. While questions remain about what the Vs really want, what Bliss is and why the Fifth Column is helping the humans, the top-notch acting and characters (especially Morris/Ryan!) keep it interesting. We adore Ryan’s battle with himself over protecting his fiancee or saving the humans. But wouldn’t you think that Ryan would have sat down with the freedom fighters and told them what the Vs want, what their plan is, that there’s a space armada on its way, etc.? But then there’s Morris and, well, somehow we don’t care about all those things so much anymore. Damon Salvatore from The CW’s The Vampire Diaries – We have never watched. Played by Ian Somerhalder. He’s hot. He’s funny. He’s evil … though not as evil as he thinks he is, and we love this charming bad boy. The Vampire Diaries wouldn’t be nearly so much fun without him. Sure, Elena (Nina Dobrev) and Stefan (Paul Wesley) are made for each other and yadda yadda yadda. And, sure, Damon and Stefan have had to work together to deal with Logan-the-vampire-on-a-killing-spree lately. But it’s not like we trust Damon to behave himself. … And that’s exactly the way we like it. Henry Foss on Syfy’s Sanctuary – yeah he’s good, but not necessarily any more of a stand out than the rest of the cast. Played by Ryan Robbins. We have to admit that when Sanctuary began during that first season, Henry was more than a little underused. And then his inner werewolf came out of the closet, and we were completely won over. Henry is a nerd who can handle the Sanctuary’s outdated computer system with more than a little bit of attitude, a la Star Trek‘s Scotty. But when he’s hanging with his best friend, Bigfoot (Christopher Heyerdahl), or going all wolfy on us, we’re completely charmed in a move-over-Scotty kind of way. Played by Misha Collins. Last season, Collins was brought in to play the angel Castiel for a few episodes. Well, the producers knew a good thing when they saw him, and Collins became a full-fledged regular this season. While we loved seeing a hedonistic future Castiel when Dean (Jensen Ackles) hopped forward five years to see what had become of the world, we actually love Castiel even more just as he is. Castiel can be scary, grim and hysterically funny. Beyond that, his chemistry with Dean is priceless. Played by Amy Acker. Yes, we know. She’s left the Dollhouse, but (lucky us) she’ll be back in January. We love this underused character and hope she gets some more meat with her upcoming visit. She’s far more mysterious than the Dollhouse itself, from her scars to her alter ego, Whiskey, to her exit from the Dollhouse. Show creator Joss Whedon once described her as “very, very, very broken,” and beyond the scars, her brokeness was written all over her face. Even after we found out many of her secrets, we knew she was special. We’re glad Whedon is bring her back before this canceled series leaves the air forever. Until then, we’ll have to see how Summer Glau does this Friday as a Topher-esque character who works for another Dollhouse. Played by Robert Knepper. New villain Samuel has been fascinating to watch as he manipulates his carnival family and our heroes in some super-secret plan. Yes, he wants to bring them together and give them a place to call home, but with what we’ve learned so far, we think there’s a lot more to it than that. The unpredictable Samuel is likable and absolutely freakin’ crazy. While we love Samuel-on-a-freakin’-crazy-mission, it’s going to be even more fun to see what happens now that Sylar (Zachary Quinto) is Sylar again and he knows there’s another badass in the world with a power he would LOVE to rip open a skull to get to. Forget the whole Nathan/Sylar/Matt/Peter/Angela thing. This is a battle royale we can’t wait to see. Played by Tabrett Bethell. Let’s face it, those oh-so-serious-and-heroic heroes on Seeker already have the fate of the world on their shoulders, so tossing a smoking’ hot Mord’Sith into the mix has added a terrific complication to the team dynamics. Cara is scary and unintentionally funny, a little like Supernatural‘s Castiel. And we never know what she’s going to do. We think Kahlan (Bridget Regan) and Zed (Bruce Spence) are right to sleep with weapons under their pillows. We would, too. And it’s exactly because we don’t quite trust her that we can’t wait to see what’s she’s going to do next, and whether she’s going to have another catfight in a hot tub. Eli Wallace from Syfy’s Stargate Universe – certainly an excellent compliment to the cast. Played by David Blue. He doesn’t have the showiest role on the series by any means, and much of his thunder has been stolen by Robert Carlyle’s Dr. Rush. But there’s no denying Eli is one of us. He’s the guy who would have spent his entire life in his room playing video games if he hadn’t literally been beamed aboard a spaceship and kidnapped by those Stargate people. He’s funny and sweet and lovable. And if any Stargate writer ever dares to consider killing off Eli, he/she should be shot. We love Eli, and he makes every scene he’s in better. Now if only Eli’s best bud, Chloe (Elyse Levesque), would realize that’s he’s so much better for her than that straight arrow Lt. Scott (Brian J. Smith). Played by Allison Mack. For nine years, Chloe has been Clark Kent’s loyal sidekick (you know, kind of like Tonto from The Lone Ranger). In the early days she was in love with Clark (Tom Welling), of course. Eventually she moved on and fell in love with Jimmy (Aaron Ashmore), until things went badly with Doomsday (Sam Witwer), and Jimmy died. Through it all, and her own meteor freak powers, Chloe has been Clark’s right-hand computer genius gal. Until this season. Angry with Clark because he wouldn’t go back in time and save Jimmy (and who wouldn’t be! ), Chloe has stepped from behind Clark’s cape and embraced her own abilities as she looks over Metropolis from the Watchtower. Finally, she’s not in love with anyone anymore, and that’s made her so much stronger. After she had Oliver Queen (Justin Hartley) kidnapped in the ultimate intervention and bugged Clark’s farm, we knew things had changed. Chloe’s not that sweet, innocent, little girl anymore. In fact, she’s willing to do whatever it takes for the greater good. All we can say is … it’s about time, woman! After taking a week off for Thanksgiving, against the “Monk” series finale which broke records for a one hour cable scripted show, viewing for “Stargate Universe” dropped dramatically for the fall finale, from 1.891 million live+SD viewers on November 20, to 1.340 million on December 4. It had a .5 live+SD rating with adults 18-49. While I have seen some live+7 numbers for SGU that suggest when it has been lower, it has made a lot of it up with Live+7 DVR viewing, there’s no getting around the Live+SD series lows. I’m trying to get the full Live+7 DVR numbers through 11/20 out to 3 digits for good comparisons and will post them if I get them (so far I’ve only seen the rounded numbers). Kevin Bachelder from Tuning into SciFi TV Not very good. Isn’t this supposed to be a space based show? TheMichaelD1985 I liked it. Obviously it wasn’t too major of a cliffhanger because we know that Rush is going to use that ship in some way. It’s been a good year for sci-fi movies, what with District 9, Star Trek and the upcoming Avatar, but who expected they’d actually be viable candidates for prestigious awards? I mean, consider this: The venerable National Board of Review of Motion Pictures, a national film group, selected J.J. Abrams’ Star Trek as one of the top 10 films of the year! When was the last time a Trek movie was in a top 10 list? The list also included Quentin Tarantino’s alternate-universe World War II movie Inglourious Basterds, Spike Jonze’s fantasy Where the Wild Things Are and Disney/Pixar’s animated Up. The organization also singled out Neill Blomkamp’s sci-fi action movie District 9 and Duncan Jones’ creepy Moon as among the year’s top independent films. What’s next? Oscar for Star Trek? The first manned commercial spaceship was unveiled today in the Mojave Desert. Virgin Galactic and it’s founder Richard Branson also revealed another surprise by naming the ship (VSS) Enterprise. We definitely let out a nerd squeal for that one! Check out an excerpt from the press release below. Virgin Founder, Sir Richard Branson and SpaceshipOne (SS1) designer, Burt Rutan, today reveal SS2 to the public for the first time since construction of the world’s first manned commercial spaceship began in 2007. SS2 has been designed to take many thousands of private astronauts into space after test programming and all required U.S. government licensing has been completed. The unveiling represents another major milestone in Virgin Galactic’s quest to develop the World’s first commercial space line providing private sector access to space using an environmentally benign launch system for people, payload and science. The spaceship draws on the experience developed during the successful flights of SS1 in 2004, which won the Ansari X-Prize for completing the world’s first manned private space flights. The SS2 design will be refined and completed during an extensive test flying program to commence shortly, and it will be an entirely new vehicle capable of carrying up to 6 passenger astronauts and up to 2 pilot astronauts into space on a sub-orbital flight. Avatar’s official running time has been announced by Fox to be 161 minutes and 34 seconds. Now, this is tad longer than the 2 ½ hours that had been doing rounds from the past 1 or two months. If we are to take into consideration the trailers then one has to sit for 3 hours. Some new featurettes have also been released for the James Cameron directed film. The new videos play differently from the ones that we have earlier seen and bear a nature documentary tone. The detailing of the visuals definitely have the signature Cameron effect to them. The Black Hole is on its way to be remade and this time the Disney speculates success to follow! Disney had tried its hands at the sci-fi genre during the late 70’s and 80’s without much success. The 1979 released film, written by Travis Beacham, is set to pick up from where it left. The Black Hole did not manage to move in a lot of audience to the theaters at the time of its release but managed a good fan following by virtue of the home video release. The Black Hole was the costliest Scifi flick of its time and this time it is being expected that the budget could go upwards with new ideas being experimented with. As for Hathaway, that’s where things get tricky. Films include The Corpse Vanishes, Warrior Of The Lost World, Santa Claus, Night Of The Blood Beast. When destiny calls, the Oceanic 6 frantically race back to the island. Discover what forced them to return and find out the fate of all those who were left behind. The answers to some of Lost’s most pressing questions are revealed in this spectacular 5-disc collection, complete with deleted scenes, a behind the scenes celebration of the 100th episode and an incredible vault of exclusive bonus features. The show that revolutionized primetime proves once again why it is television’s most addictive and creative series. The 5 best fight scenes in Science Fiction movies. If you would like to give us your SciFi 5 in 5, send an mp3 or e-mail to us at scifidinerpodcast@gmail.com.